In this lesson, we will learn how to find the intersection of an exponential function with the coordinate axes. What is the point of intersection of the 𝑦 -axis and the graph of the function 𝑓 ( 𝑥 ) = 9    ? The population of a country was 22 million people at the end of 2010. Since then, the population has increased by 1 . 8 % yearly. 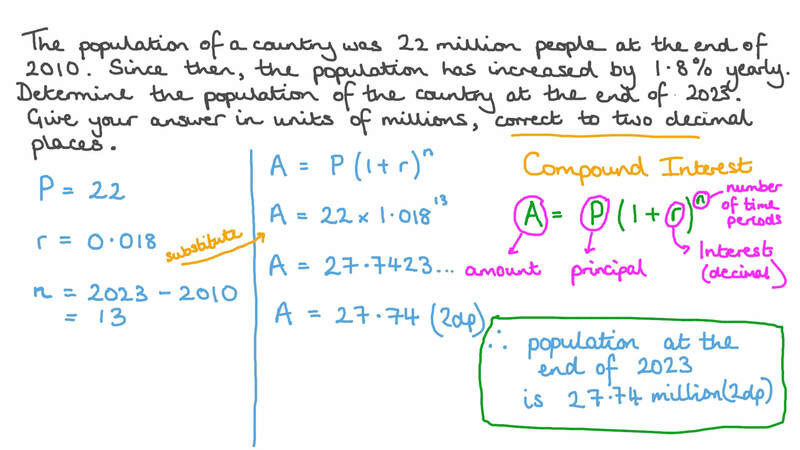 Determine the population of the country at the end of 2023. Give your answer in units of millions, correct to two decimal places. The curve with equation is the image of the curve with equation under reflection in which axis? Determine whether the function is increasing or decreasing. Find the domain and range of 𝑓 ( 𝑥 ) =  1 8  𝑥 , and determine whether it is an increasing function or a decreasing function. Find the domain and range of 𝑓 ( 𝑥 ) = 8 𝑥 − 2 , and determine whether it is an increasing function or a decreasing function. For what values of 𝑎 is the function 𝑓 ( 𝑥 ) = 𝑎 𝑥 increasing on its domain? Consider an exponential function with base 𝑎 . For which values of 𝑎 is the function decreasing? The graph shows the two functions 𝑓 ( 𝑡 ) = 1 0  0 . 9 4   and 𝑔 ( 𝑡 ) = 1 5  0 . 9 4   defined for 𝑡 ≥ 0 . Both are decaying at a rate of 6 % . What is the ratio of 𝑔 ( 1 2 ) 𝑓 ( 1 2 ) ? What is the ratio of 𝑔 ( 4 2 ) 𝑓 ( 4 2 ) ? Suppose that 𝑓 ( 𝑡 ) = 1 0 𝑎  and 𝑔 ( 𝑡 ) = 1 5 𝑏  with 𝑎 , 𝑏 > 0 . How do 𝑎 and 𝑏 compare if 𝑓 ( 𝑇 ) = 𝑔 ( 𝑇 ) at some point 𝑇 ? Suppose that 𝑓 ( 𝑥 ) = 0 . 3 ( 4 )  . Evaluate 𝑓 ( 0 ) . Evaluate 𝑓 ( 2 ) . Evaluate 𝑓 ( 0 . 5 ) . Evaluate 𝑓  − 1 2  . Find the point of intersection of the graph of 𝑓 ( 𝑥 ) = 2 𝑥 with the straight line 𝑦 = 1 6 . What is the point of intersection of the 𝑦 -axis and the graph of the function 𝑓 ( 𝑥 ) = 9    ?